J and I are not fancy food people. We’re much more comfortable in a bar eating sandwiches than in a white table cloth place with a Prix Fixe menu. I like steak, but I want fries with my steak which gets you a lot of weird looks at the fancy joints. I started looking for a place to eat in Downtown Chicago earlier this week near the PrivateBank Theatre. I got J tickets to see Hamilton: An American Musical for her birthday which is playing at that theater. I gave her a lot of options. Fancy. Italian. Pubs. I really wanted her to find something she would be happy with because it was her birthday. I had it down to about three places, but there was one that she was leaning towards….so that’s where we went. The Bar Below is on South State Street just north of West Adams Street. It’s part of Beef ‘n Brandy which has been party of the dining scene in downtown since the 1960’s. 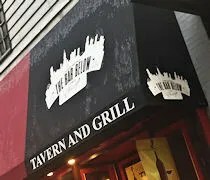 The Bar Below literally gets it’s name from being the bar below Beef ‘n Brandy. 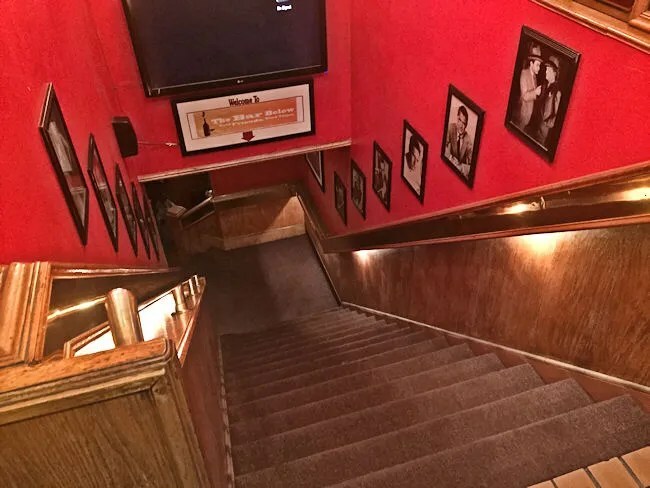 The bar has a separate entrance and as soon as you walk in, you’re met with a flight of stairs and a brightly paint wall covered in framed pictures leading to a basement bar with no natural lighting. We were met at the bottom of the stairs by a host who grabbed a couple of menus and took us to a table in the dining room. The space is two distinct areas with a dining room which is seated and a bar area with pub tables that are first come, first serve. The ceiling is stamped tin tiles and the lighting is just a little bit fancier than hanging light bulbs. The place has a really unique feel being caught somewhere between a dive bar and a casual pub. There were quite a few people eating dinner already at 5:00 when we were seated including a large group that appeared to be gathering for drinks after work. The space is pretty loud, but it was exacerbated by the rowdy group throwing a few back after a long day of work downtown. Our waitress came over as we were looking at the large drink menu. We were handed clipboards with about twelve pages of drinks and four pages of food. We needed a few minutes to look completely over the menu, so the waitress left us for a few. There are about sixty craft beers at The Bar Below with twelve of those being on tap. I wanted to stick to Chicago beers I can’t get in Michigan, so I ordered the Hyper Predator from Off Color Brewing. The beer is served in a twelve ounce glass. It’s an off shoot of Off Color’s Apex Predator. This is the same Saison but it’s brewed with cold pressed coffee to make it a little different. I actually didn’t get a lot of the coffee flavor. It was there, but subtle. Still delicious and easy to drink. 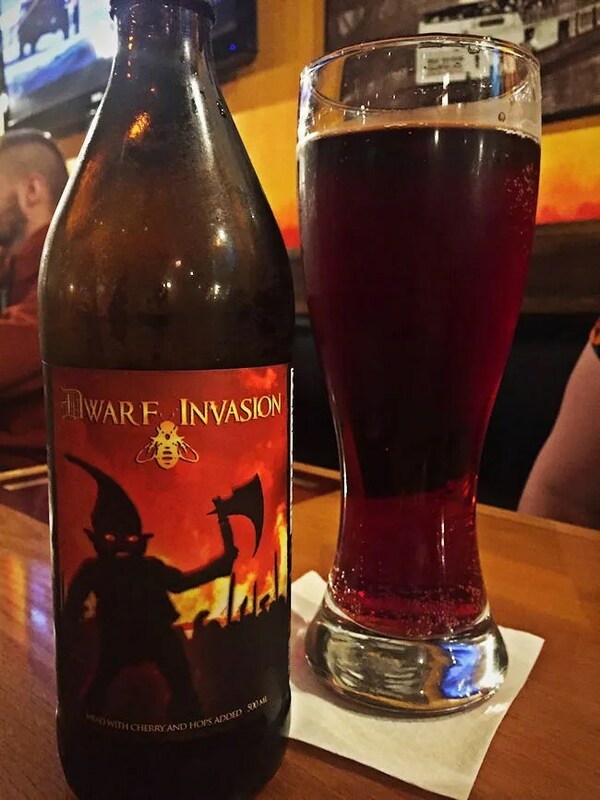 J ordered the Dwarf Invasion from B. Nektar Meadery. The mead comes in a 500 mL bottle which the waitress then poured in to a tall glass. 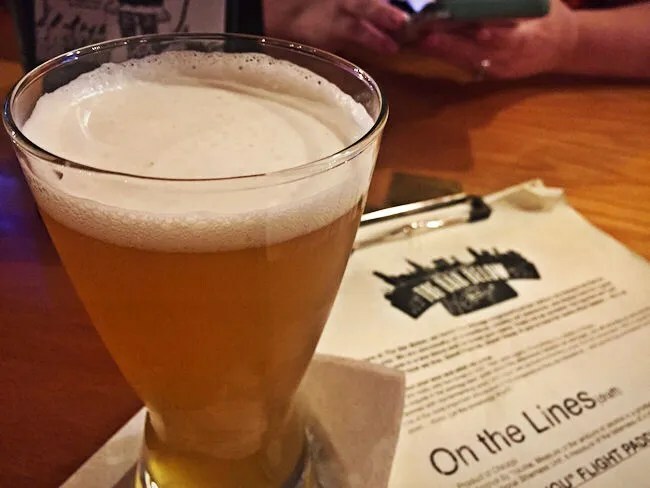 She didn’t remember ever drinking this in the past, but I checked Untappd..I usually take a few sips and check in to her drinks as well, and realized we did have this during Kalamazoo Beer Week last year. The mead had a pretty strong cherry flavor which she liked, but is a little overpowering for me. The food menu is what really drew us in to The Bar Below. I was a little hesitant because the website made the place come off as kind of cheap. While the food sounded good, I was afraid we were walking in to a dive. Once again, I was wrong. 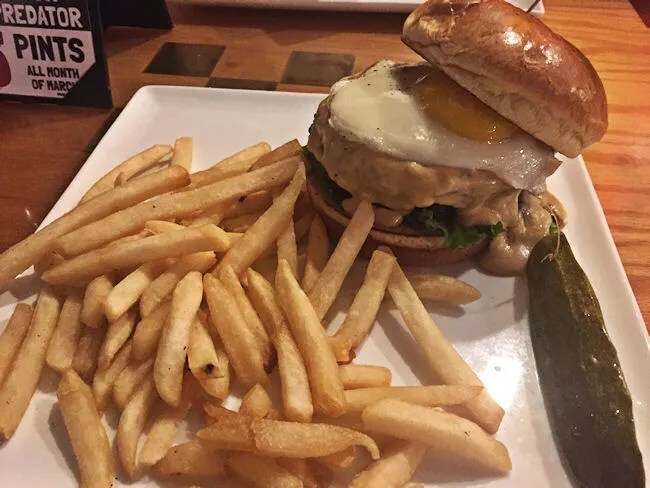 I ordered the Stout Burger. 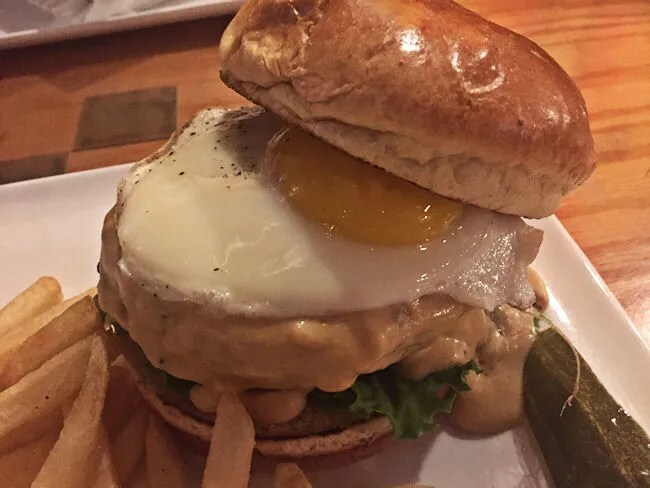 This delicious creation is an Angus beef patty topped with a sunny side up fried egg and a home made stout beer cheese sauce. The typical lettuce, onion, and tomato also come with the burger, but they’re kind of irrelevant. The cheese sauce is really the star of this show and it works amazingly well with the runny egg yolk. The burger was cooked a little past medium, but again, not really important because most of the flavor came from this delicious warm sauce that was hard for the bun to contain. The sandwich came with some pretty standard fries. They were just kind of the out of the bag kind that were super crispy and could have benefited from a little mustard…which was on the table, but I never reached over to grab it. J was going back and forth between two of the “Return of the Mac and Cheese” options. 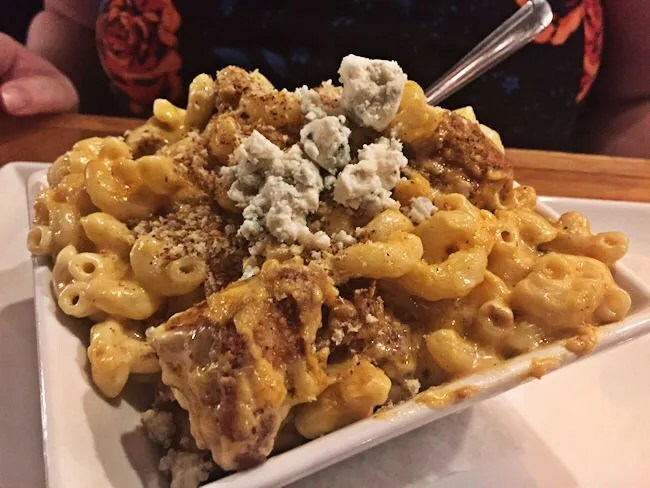 The Original Mac was the safe bet, but she took a chance and ordered the Buffalo Chicken Mac. This overflowing bowl of macaroni noodles in a thick cheddar cheese sauce is topped with large pieces of buffalo chicken breasts, bleu cheese, and toasted panko bread crumbs. Quite honestly, this one tastes as good as it looks. The mac and cheese on it’s own was very tasty, but the large pieces of chicken, which had to be cut up to eat, added just a hint of heat which was instantly countered by the bleu cheese. This is the kind of Buffalo chicken dish where the flavor really comes out and the heat is kind of relegated to the background. Our bill came out to just under $45 before tip. The Bar Below is an interesting place. 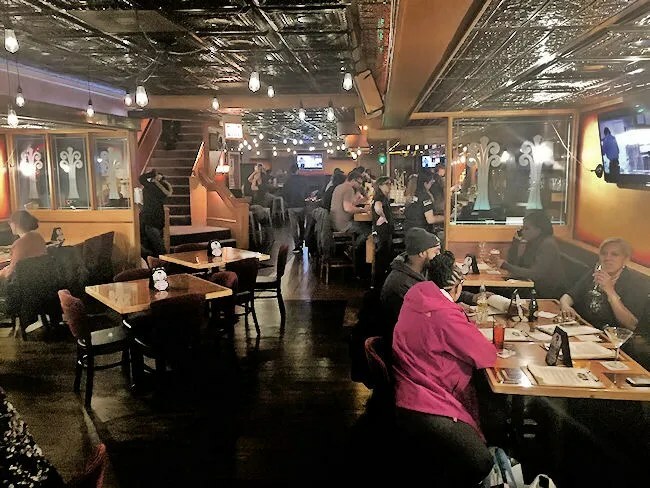 It’s a very laid back bar where anyone will feel comfortable bellying up to the bar for a beer after work, but it’s also got a great food menu and a huge craft beer list. 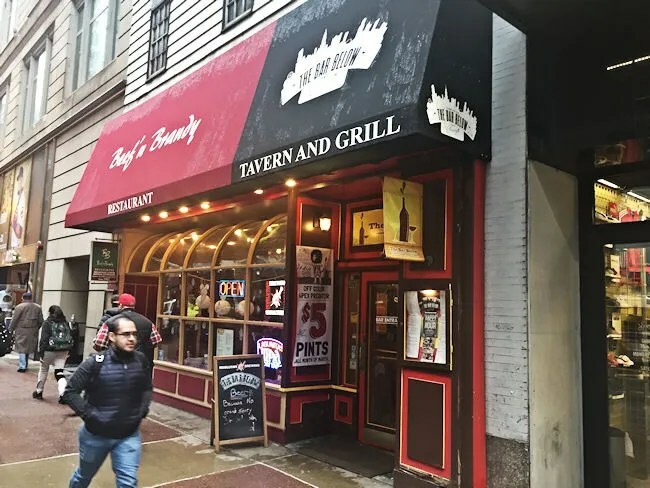 I kind of look at this place as downtown Chicago’s version of a dive bar. It’s a really cool bar, but not necessarily something that you would expect in the heart of downtown.